It is very easy to confuse engineered flooring with laminate floors, but between them are important differences. The main difference is that while laminate floors are made of synthetic materials bonded with vulcanized fibber, engineered flooring are plywood with a wooden cover. Although both have a similar appearance, at Vancouver Mouldings and Floors we will tell you the essential differences between engineered and laminate flooring. Both engineered and laminate flooring offer extreme durability, making them ideal for any room in the house. While engineered flooring is more durable compared to solid hardwood, it is still susceptible to staining and damage compared to the superior protection afforded by laminate flooring, but engineered flooring in Vancouver is ideal for below-grade installations where moisture is common such as kitchens, bathrooms, and basements, or for lake and Oceanside cabins. Engineered flooring can last a lifetime if are properly maintained, while laminate floors usually last between 15 and 30 years. Engineered flooring does not expand or contract as solid wood to the moisture variables. Laminate flooring is easy to clean and has easy maintenance, but does not reacts very good to moisture. Laminate floors can be made to resemble any type of wood or stone, while engineered flooring takes the characteristics of the most superficial layer of wood from which they are made. As we said, engineered flooring is an authentic product, made from real wood, while laminate flooring is made of synthetic materials. Laminate floors are much easier to install because its thickness is lower than engineered flooring. This can help to save money in the installation, because it can not be necessary to hire a professional to install it; however, its installation is simple and does not require polished and finished on site. Because of its synthetic composition, laminate floors are initially less expensive than engineered flooring. Longevity and the added value of a home with hardwood floors help to match the long-term cost of engineered flooring. When the time comes to replace the floor, engineered flooring can be recycled or discarded without any damage to the environment, since it is 100% organic. On the other hand, laminate flooring can not be recycled and discard it may have repercussions against ecology. 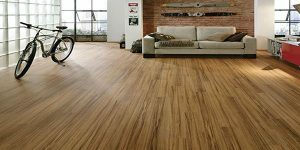 While laminate flooring provides exceptional quality and value and it is great in high traffic areas, or in homes with children and pets, sophistication and luxury is not associated with laminate flooring. Engineered flooring as solid hardwood, on the other hand, provides a luxurious feeling that is expected from the homes in higher price ranges, where quality is a must. Now you know that engineered flooring is a product of high-quality, design and sophistication, which is made of 100% natural wood of high strength and durability, manufactured by permanently bonding multiple layers of solid wood in a cross-linked structure, designed to have superior strength and resistance to moisture. This floor can be installed over wood, concrete or existing floor and like solid wood can be varnished, if needed. This type of flooring varies according to the number of layers of plywood (3-5 traditionally), the type of solid wood that are made and its finishes. These variations have aesthetic and mechanical implications, but it is basically the same format. Check out the wide variety of Engineered Flooring designs at Vancouver Mouldings and Floors and feel free to email us at bclaminate@gmail.com if you have any question. Our friendly and experienced team is around to assist you to create the perfect flooring for your ideal dream home in Vancouver. Can you use Engineered Flooring for your Basement?